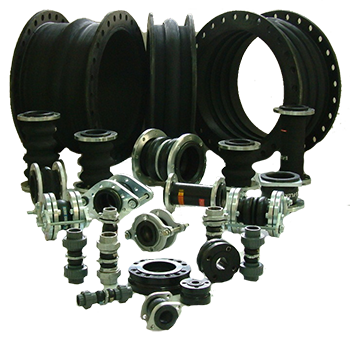 Rubber joints consist of a rubber bellows element fitted usually with fixed or floating (swivel) flanges, or pipe unions to facilitate quick installation into a piping system. The rubber bellows can be supplied in a wide range of rubber synthetic compounds including EPDM, neoprene, nitrile, butyl, Hypalon and Viton, generally reinforced with a fabric or wire insert. The flanges can be supplied in zinc plated steel, hot dip galvanised steel or stainless steel. The RADCOFLEX range covers from the moulded spherical style to complex hand-built wide arch styles with integral flanges. 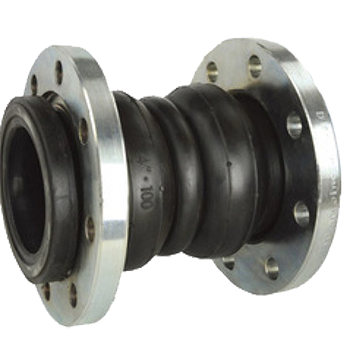 RADCOFLEX rubber expansion joints are in accordance with the guidelines of the Fluid Sealing Association (FSA) Non-metallic Pressure Piping Expansion Joints. A flexible joint made of heat resisting synthetic elastomers and moulded in a spherical shape with vanstoned metal floating flanges. Ideal for air conditioning and sanitary equipment, pumps, refrigerators, blowers, marine piping systems, feed water, drainage systems and such industries as chemical plants, shipbuilding, power generation, building and waste disposal plants. Suitable for Axial, Lateral or Angular movements. Style FSF joints are not capable of absorbing more than one movement at a time (i.e. non-concurrent), nor absorbing torsional (i.e twisting) movement. 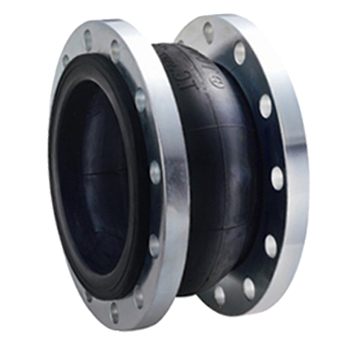 A flexible joint made of heat resisting synthetic elastomers and moulded in a twin sphere shape with vanstoned metal floating flanges, pipe unions or threaded mating flanges. Ideal for applications requiring large axial, lateral and angular movements. Industries include shipbuilding, power generation, chemical plants and buildings. Style FTF joints are not capable of absorbing more than one movement at a time (i.e. non-concurrent), nor absorbing torsional (i.e twisting) movement.